Just coming back to report solved. Yes, indeed your solution was the answer. I took the good Doctor's, and kurisu's insight to investigate if I should possibly try to add in the missing component from the Customize Menu. That did the trick, and I can now turn off/on at will, all the while keeping my Status Bar. Thank you guys (and gals) for the help, and sorry to waste your time on something so trivial. *After using the Polygon Group Editor I switched back to the Node Selection Tool to verify my polygon selections in my mesh to Genesis body parts, and was unable to select Genesis' body parts. Left clicking on Genesis just deselected everything in view-port. I had to reboot DS to get it working again. Maybe just a glitch, but if anyone can duplicate, it might be a bug. After using the Polygon Group Editor I switched back to the Node Selection Tool to verify my polygon selections in my mesh to Genesis body parts, and was unable to select Genesis' body parts. Left clicking on Genesis just deselected everything in view-port. I had to reboot DS to get it working again. Can I do the MAC procedure for Windows? e.g. uninstall DAZ and reinstall the Essentials? I, too, have all my content in another directory and since I reorganize everything, the installers wouldn't work anyway. If there is only one "Product" there is only one product preview image that could show up in "Smart Content" "Product View"
Now all installed promotional products are not showing a preview image but an orange "!" Personally I do not care about that preinstalled content besides of course the Genesis figure. Because everyone has that content it does not seem an interesting option to use in the renders. But let´s look at it from the perspective of a new user. The Genesis Starter Essentials is probably the only content they install to try DS. Now if all what they can find is orange "!" instead of the nice product preview images that were shown before they may enjoy their first visit to DS less than customers who were introduced to DS with the preview images showing. I cannot test this because I have no spare pc around that has no DS installed: But is the only reason why I still see the "old" products my "User Data" that remembers them? So this would mean new customers would not have any products showing up all but the"Genesis Starter Essentials? I am aware that it is more efficient to browse the "Smart Content" in "Files" view and use the categories to display single files. But still even now sometimes I enjoy browsing the "Product" view to get some inspiration by the Preview images for what kind of renders the content could be used. Also seeing the preview image helps me better memorize the content. But I guess there was an important reason behind the decision to merge the metadata into one product. Just for the sake of curiosity: What was it? - no checkmark for "User Data"
- no checkmark for "Overwrite Product Data with User Data"
This way the CMS cleared all reverences of the "old" products. This means they are indeed all showing up in Smart Content in just "Genesis Starter Essentials". No more separate products indeed. Does GenX need updating for this version I'm having problems with it and previously transfered morphs dissapearing. Deleted - I've just lost interest. Hmm, I see that I am missing some very old transferred morphs (I think Gen4 time), but at least my GenX transferred morphs seem to be around still - though hard to tell if they really all are around. Which ones are you having problems with? Some from the Freak 4 expansion pack and GOM Freak 4 expansion, they might well have been transfered by Gen4. Now I can't seem to get them to transfer with GenX. ..so, is this yet another beta or a stable update release? Also if GenX doesn't appear to be working from what I read, will there be an update of the plugin? It's a general release, not a beta. Will have to DL tomorrow. I'm finding this version really unstable I've had 3 unexplained crashes, GenX doesn't seem to be working correctly and DS is freezing up for a few seconds all the time. Were you doing something in particular when it crashed those three times? Or is it totally random? All I'm hearing is that it's unstable, and it seems odd to have a stable beta (4.5.1.6) and an unstable general release supposedly built from the previous beta. I haven't really had any problems, whether or not this was because I chose not to alter my CMS during each update I'm not sure. When I installed the beta after the original DS it asked me if I wanted to update the CMS (Content Management Service), I said no. I said the same when I installed this version. Like you, I did install the newer GSE and uninstalled the old ones in the process. The only issue that I've had is that there was a duplicate ID in one of the files for Axel International. I fixed this manually and DS seems to have been fine ever since. No nothing in particular just building a scene each time 1-2 figures click on something and poff DS crashes. I unistalled the CMS first the DS and then installed the new one just the same procedure I've used for previous versions. A corrupted database could be the cause. Try resetting the database in DS, uninstall CMS and DS. Delete the database files and then reinstall DS. You'll need to reimport the metadata. Is there anything else running at the same time as DS? Sometimes, another running program could be utilising the same bit of memory as DS wants to use and there might be a conflict. Press CTRL, Shift and Esc to bring up Task Manager and look at the processes. Is there something constantly running that is using up memory that DS needs? I made sure that I ditched everything that was memory intensive before I got DS. This may well have to include your AV program. Some may not like MS Security Essentials or Windows Defender, depends which Windows you have installed, but, it needs hardly any memory to run and seems to work well enough for me. And what about GenX no longer working correctly. As for resetting the database - I really don't have a clue how. On the Content Library tab/pane, click on the menu icon (above spyglass) and select Content DB Maintenance. Reset is the last item on the popup menu, and re-importing 3rd last. You and me both LOL! I feel for the creator of GenX. It seems with every DS update GenX also has to update. Any problems with any other plug ins? - So glad I didn't rush into the upgrade. I know stability of software is impacted differently by different workstations... But constant updates for plugin creators must really be a headache. Alchemy Chasm's various camera presets seem to be rather off. Don't know if it's a problem with the cameras themselves or something else. After lights, Gen X is one of the next things on my list. Here's hoping they can update it. I take it they know it does need it. ...GenX is totally worth it, especially if you have a lot of Gen4 content you want to use with Genesis. You will also need the "Legacy" body shapes for Genesis (M4/V4/S4/A4...) as well. Basically I have Genesis set up with all the V4++ and Stph4 morphs/shapes. I'll keep an eye out for any updates then. I have it think it is great especially GO Z but Mimic or Lipsynk isn't in it nor does it work with it so that is a big disappointment. 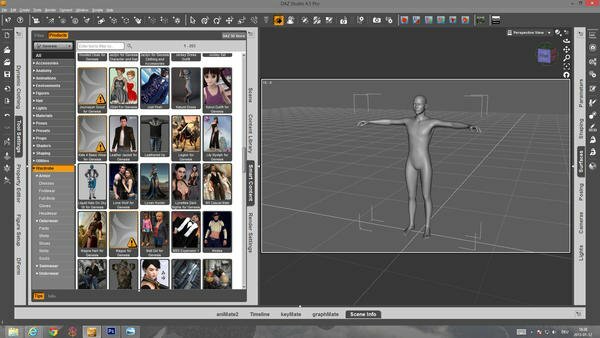 Now maybe it works in Daz 32 bit version but who uses that? I have the 64 bit and the mimic program I downloaded is 64 bit but it will not work in Daz 4.5.1.56 hell you can't even find it. What is that about? It should show up on Window - Panes(Tabs) - Mimic Live! It does need it's own serial.